The information contained on www.globalsoulconnexion.com website (the “Service”) is for general information purposes only. Global Soul Connexion assumes no responsibility for errors or omissions in the contents on the Service. In no event shall Global Soul Connexion be liable for any special, direct, indirect, consequential, or incidental damages or any damages whatsoever, whether in an action of contract, negligence or other tort, arising out of or in connection with the use of the Service or the contents of the Service. Global Soul Connexion reserves the right to make additions, deletions, or modification to the contents on the Service at any time without prior notice. Global Soul Connexion does not warrant that the Service is free of viruses or other harmful components. This affiliate disclosure details the affiliate relationships of Global Soul Connexion with other companies and products. Global Soul Connexion is a participant in the Amazon Services LLC Associates Program, an affiliate advertising program designed to provide a means for sites to earn advertising fees by advertising and linking to Amazon.com or endless.com, MYHABIT.com, SmallParts.com, or AmazonWireless.com. Pages on this Service may include affiliate links to Amazon and its affiliate sites on which the owner of this Service, Global Soul Connexion, will make a referral commission. These Terms and Conditions will apply to the purchase of the goods by you (the Customer or you). We are Clodagh Norriss trading as Global Soul COnnexion of Paseo Maritimo, 7 Blq A 2o 3a, Sitges, Cataluña, 08870 Sitges with email address hello@globalsoulconnexion.com; (the Supplier or us or we). Website means our website www.globalsoulconnexion.com on which the Goods are advertised. All Goods which appear on the Website are subject to availability and provided by 3rd party vendors. Disclosure: We are a professional review site that receives compensation from the companies whose products we review. We test each product thoroughly and give high marks to only the very best. We are independently owned and the opinions expressed here are our own. We are not responsible for the pricing, delivery or terms and conditions set out by the vendor. Risk of damage to, or loss of, any Goods will pass to you when the Goods are delivered to you by the Vendor. You can also electronically fill in and submit the model cancellation form or any other clear statement of the Customer’s decision to cancel the Contract on our website www.globalsoulconnexion.com. If you use this option, we will communicate to you an acknowledgement of receipt of such a cancellation in a Durable Medium (eg by email) without delay. If you have received Goods in connection with the Contract which you have cancelled, you must send back the Goods or hand them over to the 3rd party vendor without delay and in any event not later than 14 days from the day on which you communicate to us your cancellation of this Contract. The deadline is met if you send back the Goods before the period of 14 days has expired. You agree that you will have to bear the cost of returning the Goods. Website the website that you are currently using, www.globalsoulconnexion.com, and any sub-domains of this site unless expressly excluded by their own terms and conditions. For purposes of the Data Protection Act 1998, Global Soul Connexion is the “data controller”. Global Soul Connexion may, from time to time, employ the services of other parties for dealing with certain processes necessary for the operation of the Website. The providers of such services do not have access to certain personal Data provided by Users of this Website. You have the right to ask for a copy of any of your personal Data held by Global Soul Connexion (where such Data is held) on payment of a small fee, which will not exceed £0.00. Data security is of great importance to Global Soul Connexion and to protect your Data we have put in place suitable physical, electronic and managerial procedures to safeguard and secure Data collected via this Website. Before the Website places Cookies on your computer, you will be presented with a message bar requesting your consent to set those Cookies. By giving your consent to the placing of Cookies, you are enabling Global Soul Connexion to provide a better experience and service to you. You may, if you wish, deny consent to the placing of Cookies; however certain features of the Website may not function fully or as intended. Type of CookiePurposeAnalytical/performance cookiesThey allow us to recognise and count the number of visitors and to see how visitors move around our website when they are using it. This helps us to improve the way our website works, for example, by ensuring that users are finding what they are looking for easily.Functionality cookiesThese are used to recognise you when you return to our website. This enables us to personalise our content for you, greet you by name and remember your preferences (for example, your choice of language or region). 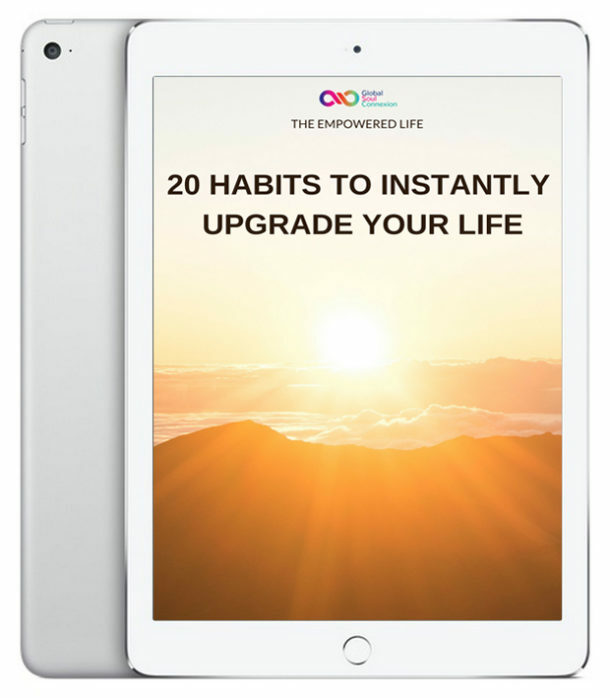 Download our free mini guide : 20 life-enhancing habits to help you instantly upgrade your life. 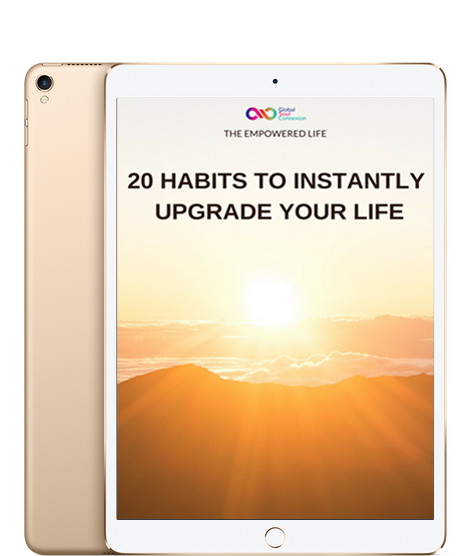 These easy-to-implement tips will assist you to find balance in your day and help create a life of peace and fulfilment.